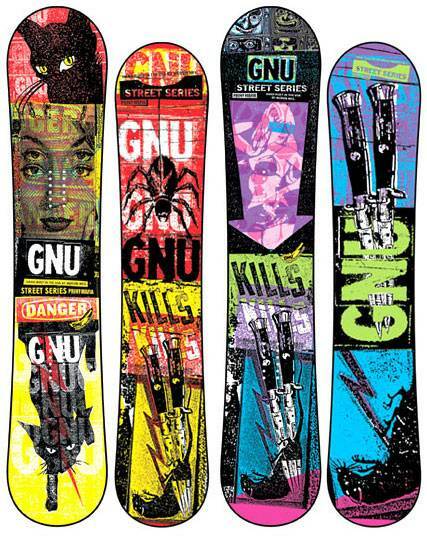 The Gnu Street Series has the same general ride as the previous models except for a little more stability between the feet thanks to a tweak tot he BTX in 2014 The rocker between the feet is about the same as before but after the rocker the profile goes flat to maybe just a tiny little bit of camber at the tip/tail. Still, it’s a pretty similar ride from 2010-2014. Conditions: Practically Perfect Sierra Snow with some well-groomed parks. Set Up: Centered 23″ wide 15 front -15 back. On Snow Feel: The Gnu Street Series 2014 is very similar to the older models but the slightly altered BTX camber profile makes the ride a little more stable between the feet and gives it a little bit more of a hybrid rocker feel. It’s still very much a BTX ride though. It’s just a more stable BTX that barely makes it into the semi-stable category. It’s a very playful poppy ride that makes for a great jib park specialist that has a decent pipe and jump aftertaste…..well for a jib board. Powder: The Gnu Street Series 2014 has the same kind of float that wants to stay up but you will be sized down so it’s not ideal for easy float in deeper or thicker powder. It’s better than most boards it’s size but it’s still nothing to write home about. Turn Initiation and Carving: Very quick and easy edge to edge. It felt like a little board that has a big board ride when going straight but the minute you want to turn it’s there and effortless. Carving was not that good but it was better than the previous model. There is a little less of a washy feeling. Speed: This is no bomber board and the chatter emerges at moderate mountain speed or on an approach to a bigger kicker. It’s very much a jib board but it’s better than you would think for a jib board. Uneven Terrain: If you want to go out on the mountain and find natural bonks and such you will be fine if you hit a crappy patch of bumpy snow. Edge Hold: It really grabs and holds securely in the snow. Flex: Medium soft at first but after it breaks in you have more of a soft flex that is easy to butter and easy to flex/bend around tighter rails. Jibbing: The Gnu Street Series 2014 is a pretty fun jib board and although we liked the Box Scratcher better this was, it was really close to being as good as the Box Scratcher. Pipe: If the edges stay sharp this isn’t bad in the pipe. Most jib boards I wouldn’t dream of taking in the pipe but I didn’t even think twice about it. Jumps: Nice spring from between the feet and it’s a little better off the tip/tail now. It’s not a bad board for hitting a kicker or 2 and it pops well when it comes to an ollie. All in all, this is a fun Jib board that is also a good all-rounder park board. We liked the Box Scratcher a little bit better but both are really great boards for those that live to jib but also like other places in the park. The Gnu Street Series 2013-2010 is all about it’s name. This is there “street series”. Try and guess what this is for??? Not much has changed between 2010 – 2013 The only thing is the BTX keeps getting slightly refined over the years. This is very similar to the Lib Tech Box Scratcher n the way it rides and is a very aggressive street board. 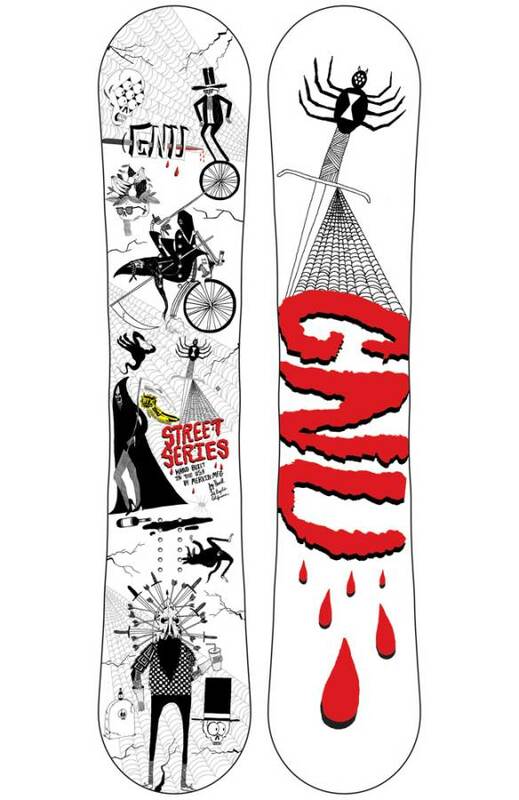 The Gnu Street Series is a top notch jib/street specialist that we strongly recommend over almost any board other than the Box Scratcher. It was very hard to put into words why but for some reason we liked the all around feel of the Box Scratcher more than the street series. If you compare it to most other Jib/street specific boards it’s still one of the best out there but it just didn’t have that magic like the Box Scratcher. Conditions: Pretty good but some hard spots in many places. On Snow Feel: Its a very loose playful jibby kind of ride. It isn’t like a lot of jib boards that have a lot of flat between the feet but it does a great job. Powder: Nope not going to happen here but not bad for it’s size. It points up and that helps a lot but it’s still difficult to keep going in powder. Turn Initiation– Very easy edge to edge and it makes it easy to micro adjust without being twitchy. Speed: Not the Street Series strong point but that is expected. Uneven Terrain: Not bad if you leave the jib park to deal with bumpy tracked up end of the day snow. Approximate Weight– pretty heavy for the size but it’s sturdy. Edge Hold: Right out of the factory the edge hold is excellent but even after filing them down and beating them on rails the edge hold will still be pretty good. Flex: The Street Series starts out soft and then gets softer over time. You can butter this for days. Jibbing– Hit anything you can and ride all that you want in the jib park. It’s one of those jib boards that boots confidence. It’s very forgiving on even the most technical rails and a fun board to progress with. The continuous rocker is closer to flat so its stable between the feet when on rails. We had fun on bonks and just felt at home anywhere in the jib park we went. Pipe: With good edges the Street Series can ride a pipe pretty well for a jib board but it’s no pipe specialist. Jumps: Pretty springy but not a jump specialist either. 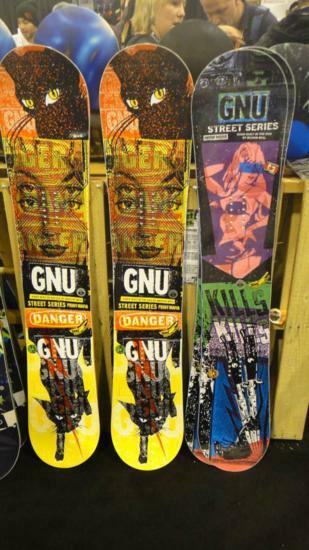 We try to get as many images of the Gnu Street Series, but forgive us if they're not all there.